A few months, I happen to stumble across a HOT new music duo when I was wasting away my day on YouTube. The band “Karmin” are two up and coming artists that have been using YouTube to jump-start their music careers. Like thousands of other musicians, they are using the power of the second largest search engine to reach music lovers worldwide. Don’t get me wrong, there are plenty of starving artists out there, that are trying to use YouTube as their springboard to fame…and fail. 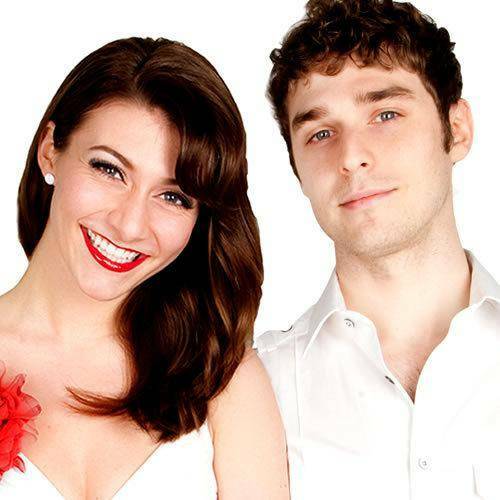 However Karmin is actually one of the few that successfully launched their brand using YouTube and social media. Before we take a look at their social media strategy, have a listen to them….they rock! OK, on to the case study. It’s pretty straightforward, but from analyzing the Karmin social media strategy, I have come up with the following goals. Covers >> Original Music: It seems that a way that they could start to build an initial relationship with music lovers and build a following, was to start creating music covers of popular songs on the radio currently. For one, they are able to optimize each video for highly searched songs on YouTube. This will help get eye-balls on their videos. From there, they have added their original music in, to try to get the user from just being entertained…to becoming a fan. Build Their Brand: Using places like YouTube, iTunes, ReverbNation, Facebook, Twitter, etc…they are trying to get in front of a huge market of music lovers looking for the next new breakthrough band. Gain Subscribers: As you can see in their YouTube channel, they have a strong call to action to subscribe. Once you subscribe, each user will get an email telling them that they have added a new video to their channel…driving them back to their music and brand! Purchase Their Music: Using the Apple iTunes music store and the call to actions on their YouTube channel, the ultimate goal is to get people to buy their music. First and foremost, they have talent. 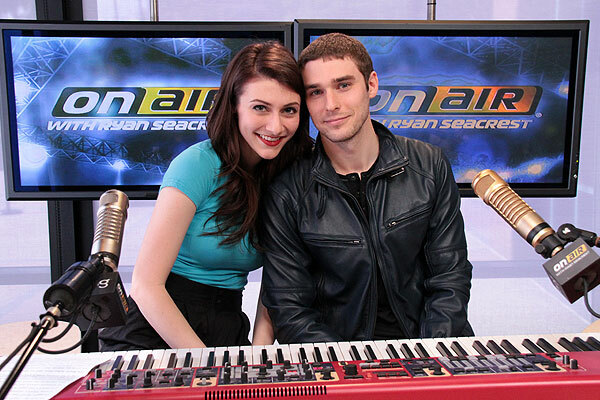 Both Amy and Nick from Karmin went to the Berklee College of Music and are extremely passionate about music. Web users have much higher standards these days when they are browsing online. This means if you have low quality video/audio, they will just move on. As you can see from the above videos, all of their videos are in High Definition video and audio. This gives each of their videos a professional touch and makes them more engaging. I am not sure if they edit the video themselves or if they hired an editor, but each video is edited extremely well, making their videos seem like normal music videos you would see on MTV or VH1. 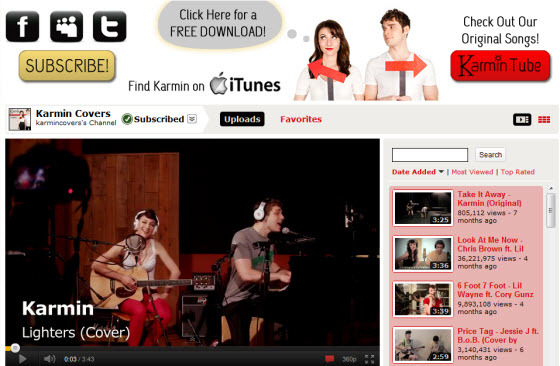 If you visit the Karmin Music YouTube channel, you will see a stunning channel design! Utilizing clever call to actions and photos of the two, they are able to help build their brand, entice users to subscribe to their channel, and download their music. All of the great covers that you watch on their YouTube channel can be purchased in the Apple iTunes store. Their iTunes store has a number of covered songs, then a number of original tracks. As you can see from the screenshot below, they have saturated all of the “music-related” sites with their own personal page/site. On top of the over 500,000 YouTube subscribers and 5 million channel views, you have to realize that there are plenty of other outlets that music lovers use to find and listen to new artists. To keep their raving fans up-to-date on new music, events, and Karmin news, they are using Twitter & Facebook to spread the word. This also can be a way for Amy and Nick to personally interact with their fans and continue to build loyal fans and relationships. It was only a matter of time until Karmin made it BIG. After all of their hard word, dozens of videos and social media efforts, they were able to tap into the mainstream media. They give the secrets to their social media success in the video below. This is a really powerful video that anyone who is looking to use Social Media to build their brand, need to WATCH. Amy talks about Gary Vaynerchuk and how he was a large influence in how they use social media to build their brand. Are You Optimizing Your YouTube Videos Properly?